I know I have a lot of s’mores based recipes on my blog, but this one might be my new favorite. The combo of peanut butter and s’more is to die for, and these guys come together in a snap. 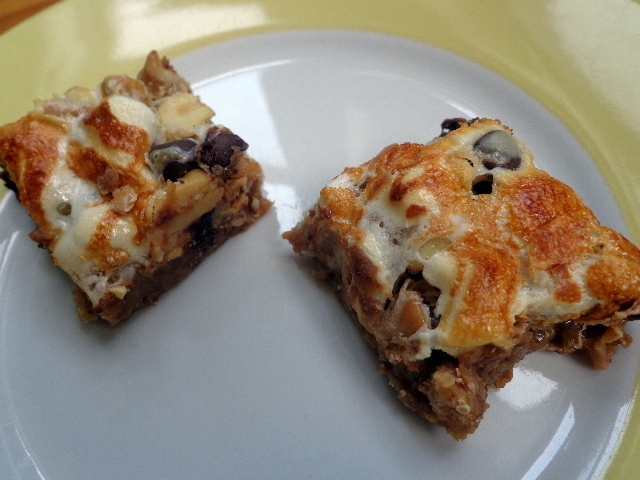 Modeled after 7-layer bars, they are chewy, gooey perfection. Place butter in a 9×9 inch baking dish in the pre-heating oven until melted. Pour graham cracker crumbs into melted butter, mix together with a fork, and press into a thin, even layer in the bottom of the baking dish. Sprinkle peanuts, peanut butter chips, and chocolate chips in an even layer over the crust, alternating ingredients so they are mixed together rather than in layers. Top with marshmallows. Drizzle the sweetened condensed milk on top. Bake for 30 minutes, until the sweetened condensed milk no longer looks soupy. Allow to cool before cutting into squares. You can serve these right away, but if there is a time gap I recommend storing them in the freezer so that they get nice and firm.